Are corrupt countries more vulnerable? Are vulnerable countries more corrupt? Transparency International has launched its annual ranking of corruption, pointing to the negative effects of public sector graft on the poor and vulnerable. The ranking combines a range of factors to produce a best-to-worst chart. Denmark comes out on top, while Somalia and North Korea share the bottom ranking. Alternatively, the INFORM index is a ranking of countries according to their humanitarian risk. A score from 0 to 10 is derived from a range of elements, including a country's exposure to various risks, natural or man-made, and its ability to deal with them. 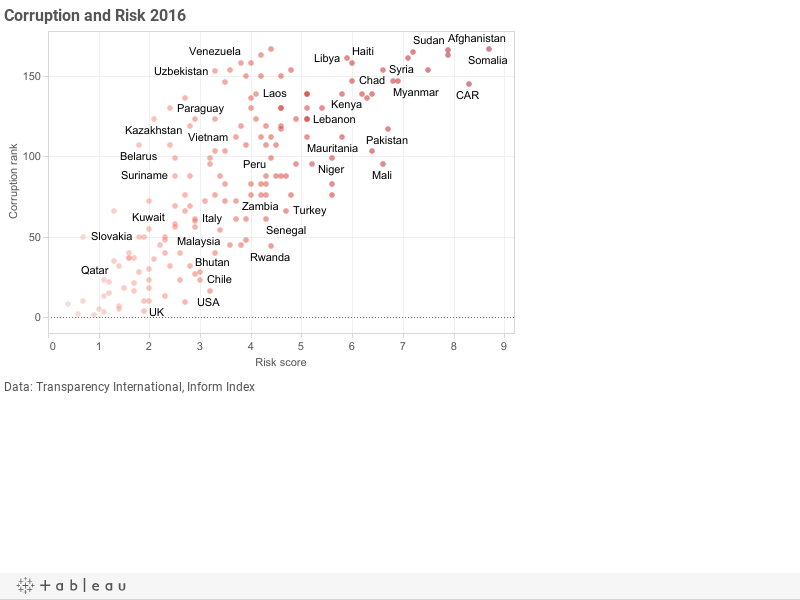 On this ranking, Singapore is the least risky, and Somalia the most. If your country is prone to earthquakes, corruption can't be blamed. The INFORM index includes "Institutional Capacity" as only one of the many factors in its formula. A government mired in corruption will not respond well to a natural or man-made crisis. So what is the picture when you combine the two? Judge for yourself in the graphic below. At the worst end of both scales, we see a cluster of troubled countries, Afghanistan and Somalia in particular, both facing the impact of years of conflict and severe poverty. At the bottom left are some Nordic countries and Singapore - neither corrupt nor risky in humanitarian terms. A few countries appear to buck the trend: Kazakhstan scores badly on corruption but isn't looking too bad on humanitarian risk, while for Mali and Ethiopia, it's the reverse.